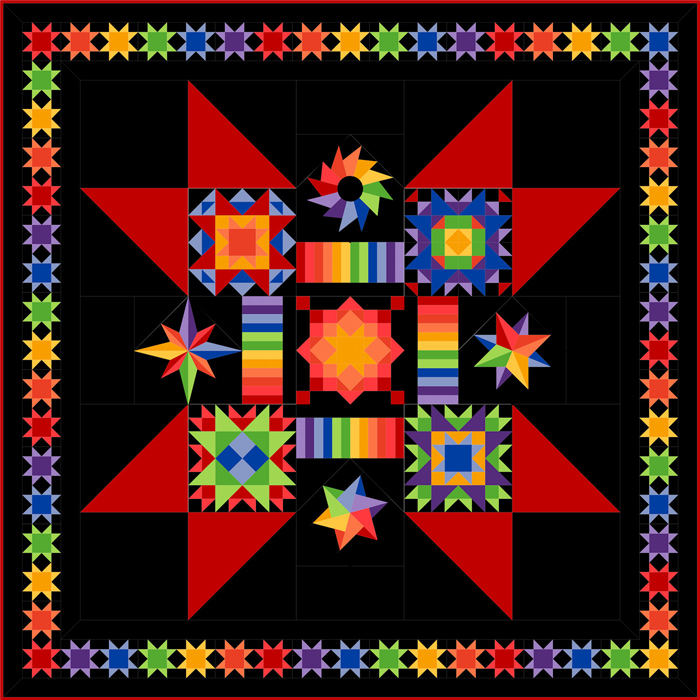 Block of the Month Color My World Bright — featuring Cotton Supreme Solids by RJR Fabrics. Made from RJR’s high quality Cotton Supreme Solids, the captivating Color My World features an array of unique pieced stars set together to create a secondary medallion star center. Also included are 3 BONUS projects to make a wall hanging, dresser scarf and accent pillow. For the perfect finishing touch, quilting motifs, including a feathered wreath and feather spray, are contained in the final installment. Finished Quilt is 90″ x 90″. Block of the Month does include pattern, fabric for top and binding. Block of the Month does not include batting and backing. Notice: Blocks of the Month are a commitment and are noncancelable. You will be put on automatic shipment with the block being mailed by the 21th of each month. This entry was posted on Wednesday, June 6th, 2012 at 1:00 am and is filed under Uncategorized. You can follow any responses to this entry through the RSS 2.0 feed. You can leave a response, or trackback from your own site.